We don't chase the market, we create the market! Offices Throughout Virginia and Affiliates Nationwide! a. Auctions are not distress sales. Auctions are a proven technique for selling property in a compressed time frame at true market value. b. Auctions have a rich history of success that spans over 3 centuries. Over $50 billion of real estate is sold in the United States every year via the auction method of marketing (2006 NAA). Nicholls Auction Marketing Group, with over 4 decades of auction superiority and over 100 years of combined experience, has been synonymous with excellence and success in the auction marketing and sale of real estate. c. The award winning marketing prowess of our firm (over 100,000 buyers visit our web site monthly!) ensures completely individualized, highly structured advertising programs that saturate the marketplace (print media, public relations, world wide web, signage, TV, e-mail blasts, etc.). d. Tightly crafted contracts that are closing oriented with no contingencies equal a near 100% closing rate. e. Our structure allows you, the seller, complete control of the entire transaction. a. Absolute Auctions: The word absolute is defined as being “free from restriction or limitation.” Absolute auction events are auctions when the product sells to the highest bidder regardless of price. Since 1968, our firm has witnessed that absolute auctions increase your auction attendance and interest by at least 50% and increase your overall return by at least 25%. We have personally sold several of our own family properties via this method. b. Auctions with an Undisclosed Reserve Price = These are auction events in which the seller and auction firm mutually agree that the product will not sell unless and until an undisclosed reserve price is met or realized. Quite simply, if the auction price does not meet or exceed the reserve price, the property does not sell. c. Live Outcry Auctions = These are auction events that are held on site or at a neutral location, and are conducted by the auctioneer “calling the bid” in a traditional auction chant style. d. Online Only Auctions = These are auctions that are totally conducted and transacted through 100% online bidding via the internet. Typically, these are timed events where the buyer has a certain number of days or hours to competitively bid on property with a designated close time. e. Live/Online Auctions = These are auctions where the seller and buyer can conceivably get the best of both worlds. These auctions combine the “live outcry” method and the “online” auction method. Buyers can choose either to show up at the auction and bid to the auctioneer “live on the lawn” or bid live real time online via the internet. Our firm conducts these type of auctions at most of our events. f. Fund Raising/Benefit Auctions = Since our firm’s inception in 1968, we have successfully raised millions of dollars for thousands of non-profit and for-profit organizations, institutions, schools, and businesses. It is our commitment that our team of champion auctioneers and world class bid assistants will bring more money to your event than you have ever realized. In short, our services will never cost your organization money, we will only make your organization money. In addition to auction services, we also can negotiate to be available for pre and post auction consultation via in person meetings, conference calls or webinars. We pay 20% of our commission to any Realtor who pre-registers and represents their client as the successful buyer. There are strict rules and guidelines that must be followed, so please read the Broker Participation Form carefully before you fill it out. Click to download from the App Store! Click to download from Google Play! 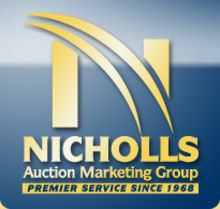 John S. Nicholls is President of Nicholls Auction Marketing Group, Inc., and oversees all day to day operations of the company. As a second generation auctioneer, licensed in 11 states and the District of Columbia, John earned a BA in Psychology and a MS in Personnel Services. In 1990, John graduated from the World Wide College of Auctioneering in Mason City, Iowa, and is currently one of the school's featured instructors. John currently conducts over 300 auctions per year for Fortune 500 companies and is a licensed realtor. Under John's leadership, Nicholls Auction was named Business of the Year by the Fredericksburg Regional Chamber of Commerce. John is an active member of the National Auctioneers Association, and currently serves as President and also holds the designations of Accredited Auctioneer of Real Estate and Auction Technology Specialist. John also is a past President and Chairman of the Board of the Virginia Auctioneers Association. In addition, John has been a featured speaker at many state auctioneer associations throughout the country. and has had the honor to represent the auction profession on the TODAY Show, the National Association of Realtors Convention, St. Judes Children's Research Hospital, multiple news publications, and on a real estate auction consulting trip to South Africa. John is active at Spotswood Baptist Church in Fredericksburg, VA, and serves on the Boards of Virginia Community Bank, the World Automobile Auctioneers Professional Association, and the Joe Gibbs Youth for Tomorrow Foundation. Some of John's honors include the following: 1994 Virginia State Champion Auctioneer, 2003 Virginia Auctioneer of the Year, 2003 World Automobile Auctioneer Champion (Nashville, TN), 2006-07 NAA Men's Division Champion of the International Auctioneer's Championship (Orlando, FL), 2015 National Auto Auction Association's Bernie Hart Memorial Auctioneer of the Year Award, 2016 Virginia Auctioneers Association Hall of Fame Inductee, and World Wide College of Auctioneering Hall of Fame. J.T. Clark, a resident of the Richmond, VA area throughout his adult life, has been with Nicholls Auction Marketing Group since 1987. He is a 1986 graduate of the Mendenhall School of Auctioneering in High Point, NC. and is also a graduate of Mosley Flint Real Estate School. J.T. has been a member of the National Auctioneers Association for his entire career. He is a past President of the Virginia Auctioneers Association (2008). In 1988 he was awarded the titled of Virginia State Champion Auctioneer. In 2004 was the recipient of the VAA Auctioneer of the Year Award and in 2012 he received the Jake Horney Memorial Award for his service and dedication to the VAA and the auction profession. David Clark graduated in 1989 from the Mendenhall School of Auctioneering in High Point, NC, and soon thereafter developed a relationship with Nicholls Auction Marketing Group. David is a subcontract auctioneer working four (4), or more, auctions weekly for several large companies including two major US corporations. He works in the Richmond area in real estate and equipment auctions, and he is an active member in the Virginia Auctioneers Association. Grover A. "Tony" Wilson is a life-long resident of Orange County Virginia. Tony is a successful business person in the region and has been for over 28 years. In the spring of 2008, Tony was named “Business Person of the Year” by the Orange County Chamber of Commerce. Tony has an extensive background in marketing, management and sales, including completion of the “Management Success” Training School in Glendale, California. He is a graduate of the Pleasants School of Auctioneering. Tony is a member of the Virginia Auctioneers Association and the National Auctioneers Association and currently sets on the board of directors at the state level. Tony holds the following NAA designations CES (Certified Estate Specialist), AARE (Accredited Auctioneer, Real Estate), and ATS (Auction Technology Specialist) and is a licensed realtor. Tony is very active in community service related activities, and is a life member at his local volunteer fire department where he has held various offices to include Captain and President. He also serves on the board of the Orange County Chamber of Commerce, and the Orange County Economic Development Authority. He has been a president of the Virginia Auto Recyclers Association as well as the Orange Business Exchange. Bill Harlowe brings a storied auction career to the NAMG team. Bill has been a powerful force in the auction community in the Charlottesville and Central Virginia area for over 40 years. Bill was the founder and CEO of the highly respected and successful Harlow-Powell Auction Ltd. Bill is a 1968 graduate of the Reisch School of Auctioneering (now World Wide College of Auctioneering), the prestigious Certified Auctioneers Institute, and the Weaver Real Estate School. An active member of the Virginia Auctioneers Association, Bill has served as President, Board of Directors member, featured seminar instructor, and was honored by being enshrined into the Virginia Auctioneers Association Hall of Fame. Bill currently conducts several auctions each week, and is an active member of the Blue Ridge Mountain Rotary Club having served as President and Board member. Bill and his lovely wife, Roberta, are lifelong residents of the Charlottesville and Fluvanna County area of Virginia, and are active members of Beaver Dam Baptist Church where Bill serves as Deacon and Bible teacher. Chuck Harlowe is a second generation auction professional who also is a certified residential real estate appraiser. Chuck graduated from Mendenhall Auction School in 1988, and received his Bachelor's Degree from Randolph Macon College in 1992. Chuck served on the Economic Development Commission for Fluvanna County from 1998-2003, and also served our country in the United States Naval Reserves. Born and raised in the Charlottesville/Fluvanna County area, Chuck brings a wealth of real estate knowledge to the NAMG team. Chuck is a member of Calvary Chapel in Fluvanna, and enjoys coaching Upwards Basketball. Chuck and his lovely wife, Melanie reside in Fluvanna County with their two children, Anthony and Annabelle. Jimmy Grindstaff is founder and President of Grindstaff Auction and Realty Inc. A second generation of auctioneer, he is dedicated to the auction industry. Jimmy has been in the auction industry for over 40 years. Jimmy has an impressive auction knowledge of antiques, farm & business equipment, estate liquidations, and real estate. Jimmy specializes with On-Site auctions with an emphasis on antiques, real estate and liquidations. Jimmy is an active member is his church and volunteers for numerous groups and organizations. He is an active member of National Auctioneer Association and Virginia Auctioneers Association. Anne Grindstaff is Vice President and director of Grindstaff Auction and Realty Inc. and oversee all day to day operations. After her studies at VCU, she graduated from Mosley Flint Real Estate School and has been in the real estate business for 20+ years. Anne has attended various sales schools throughout the east coast. She is a 2003 graduate of Mendenhall School of Auctioneers in High Point NC. Anne is an active member in her church, and volunteers for numerous non-profit groups and organizations. Anne holds the designation of CES (Certified Estate Specialist), ATS (Auction Technology Specialist), and is currently pursuing the esteemed Certified Auctioneers Institute (CAI) designation. Anne is an active member of National Auctioneers Association and Virginia Auctioneers Association. Sid Smyth is a lifelong resident of South Central Virginia living in Lunenburg County. He has been a full time real estate Broker since 1999. In 2008, Sid received his Master’s Degree in business from Virginia Commonwealth University with a concentration in real estate valuation, finance and development. Sid graduated from the East Coast School of Auctioneering in 2003, and he is currently enrolled in the Certified Auctioneers Institute. Sid has served on various Boards over the years including 15 years on the Lunenburg County Board of Supervisors, member of the regional planning district board, and currently is a member of the Crossroads Community Service Board. Sid is active with the Boy Scouts and is a Vestryman for St. Paul’s and St. Andrew’s Episcopal Church. Sid has an office in Victoria, VA, where he represents Nicholls Auction Marketing Group and Long and Foster Realtors. Tammy Dodson Reid is a lifelong resident of the Fredericksburg, Virginia area. Having lived in Fredericksburg, Stafford, Orange and Spotsylvania counties, Tammy is an established successful business person in the area and has been for over 30 years. Tammy joined Nicholls Auction Marketing Group in 2014 with a diversified background in sales and marketing. She has received various awards throughout her professional career, such as Fredericksburg Area Builders Association “Associate of the Year” (two time recipient) , “Rookie of the Year”, and “Committee Chairman of the Year” to name a few. Tammy and her husband John currently reside in Spotsylvania County. Together they are very active in the community serving at their church, in the Spotsylvania County Partner in Education program, members of various local organizations such as Fredericksburg Area Builders Association (Board of Directors, Associate Committee, Membership Committee & Ambassador) , Fredericksburg Area Association of Realtors, Fredericksburg Area Food Bank (Board of Directors & Volunteer) and Fredericksburg Regional Chamber of Commerce Ambassador.